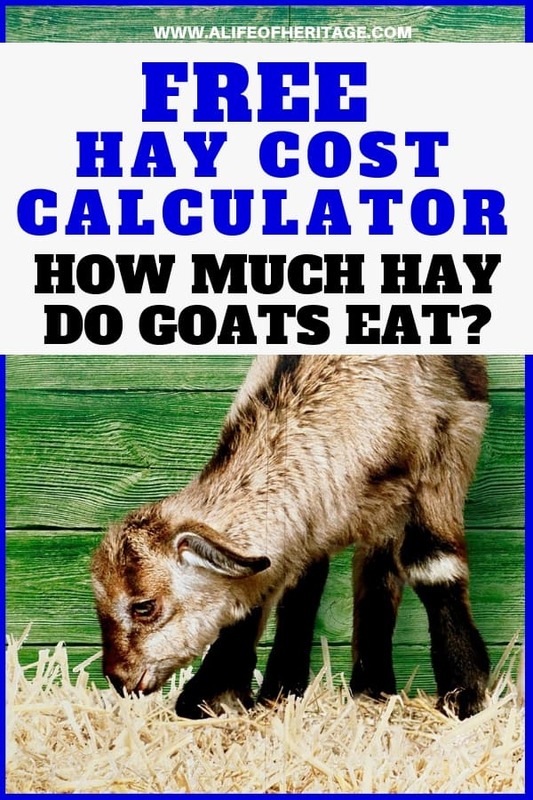 Hay Cost Calculator for Goats: How Much Hay Do I Need? Inside: Do you know enough about goat feed? 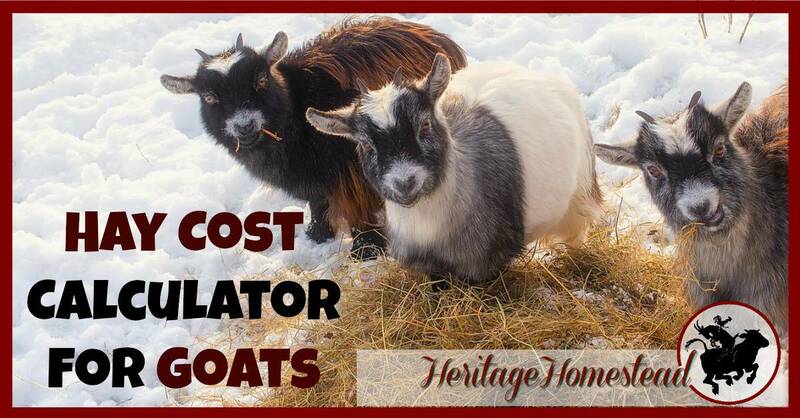 Use this FREE Hay Cost Calculator for Goats. How much hay do I need for my goat? This will help you make a plan and know how much hay to buy a year. This is one post of many from our Raising Goats resources. I hope you are fortunate enough to own goats (presently or in the near future)! They are such a blessing! Not only are they good friends, but they provide delicious milk and the cutest kids! But that doesn’t mean they don’t come without cost. Although I haven’t done thorough research on this for our own family, my suspicion is that we actually would save money if we bought milk from the store. But I have a firm belief it is worth it in every way to own goats! But first! Goat feed is an important first step to have in place before you own your first goats! And if you already own goats, this calculator will help you figure out how many ton of hay you will need to get your goats through the year. Fill in the blanks and it will give you the answer! Easy peasy! Then fill in the approximate total weight of all of your goats. Not sure how to find out what your goats weigh? Go here: How to figure out how much my goat weighs: Goat Weight Calculator. Now, here’s the deal, as you can see, there is an average for what non-milking goats and milking goats eat on a daily basis. It’s an average. These formulas have used the middle of the averages. It is so important that an assessment on each goat be made on a regular basis to ensure that they are receiving the necessary nutrients. Check out our “Easy Goat Gestation Calculator”, where you can also read about the care of a goat during pregnancy and how detrimental it is for a goat to be under and overweight. When you know how many ton of hay you will need for the year, find out what a ton is selling for in your area and multiply that by how many ton you need. If you don’t own goats yet, I hope that this calculator helps you get an idea of what you will need to plan for in hay to be ready for your goat feed. And if you already own goats, this is an easy way to get an estimate of how much hay you will need each year. But what else can you expect to feed your goats? If you own horses or are thinking about getting a horse, you may want to check out our Hay Cost Calculator for horses and the Horse Cost Calculator. You also may be able to glean some information here: Calculating Livestock Winter Hay Needs, Tending Goats, What do goats eat? Do you like FREE information to help you homestead? Check it out below. Great calculator–they aren’t cheap, are they? Fortunate for us, we grow our own, but we must always figure out how much to keep before we sell off the rest.